On the last day of campaigning, final opinion polls ahead of Sunday's vote are likely to show the most polarized election in a generation going to a run-off vote between Bolsonaro and leftist Workers Party candidate Fernando Haddad. Far from harming his grassroots campaign, Datafolha reports Bolsonaro's preference increased from 28% to 32% after the global outrage as opposed to Haddad's, who went down 1pc to 21%. He has been covering the election from Rio de Janeiro. A duel between Bolsonaro and Haddad would see a 44-42 percent split, according to Datafolha - too close to call given the plus-or-minus-two-point margin of error. Brazilians will go to the polls this Sunday, but the victor of the presidential race won't be decided until a runoff is held later this month, according to a leading pollster. Haddad's support relies on the popularity of his mentor, former president Luiz Inacio Lula da Silva, who was barred from running due to a corruption conviction. 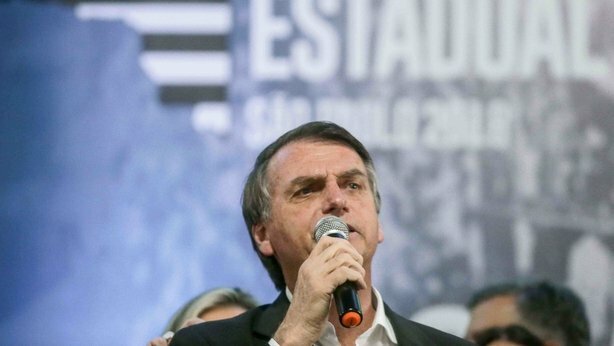 Bolsonaro has faced federal charges of hate speech after racist, homophobic and misogynist rants, but in a live speech on Facebook earlier on Thursday, he rejected the accusations. Polls show the current frontrunner is the far-right Jair Bolsonaro, a former army officer who has openly praised Brazil's military dictatorship, which lasted from 1964 to 1985. In recent weeks, as Bolsonaro's poll numbers have risen, his rivals have found it hard to draw attention from the convalescing former army captain. Front-runner Jair Bolsonaro, 55, has surged on widespread anger over rising crime, a drifting economy and the prospect of the leftist Workers Party returning to power. It would also block efforts to legalise abortion, drugs and gay marriage. Investors and the economic elite appear swayed by his plan to usher in austerity and privatizations to cut Brazil's climbing debt, this week sharply driving up the Sao Paulo stock market and the value of the real against the dollar.